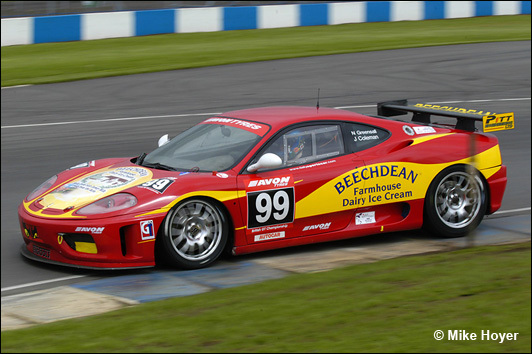 There was a new look to the driver pairing for the Beechdean Ferrari at the second meeting of the season, at Donington Park. The eminently likeable Neil Cunningham joined Nigel Greensall, to create arguably the strongest driving pairing in the class. If you had to pick any two drivers to get the best out of the Ferrari 360 (especially while it was still in its development phase), you’d probably go for these two. It was a bonus that Cunningham had driven for the team last year, though that was in their none-too-standard BMW-engined MINI. 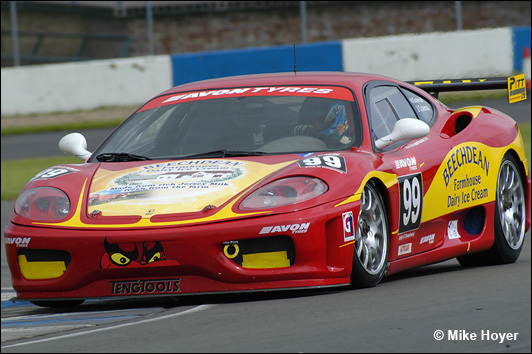 The combined experience of these pilots is immense, as is the range of machinery they have enjoyed, but Nigel Greensall’s first Ferrari 360 race was the last round of the Championship and this meeting was Neil Cunningham’s first taste of the Italian marque. That was encouraging pace for a car that had not yet run a race in anything other than the most basic of set-ups. As the track dried on Saturday morning, the conditions began to suit intermediate tyres rather than wets, and anyone making the switch was thrust up the timesheets as a result. 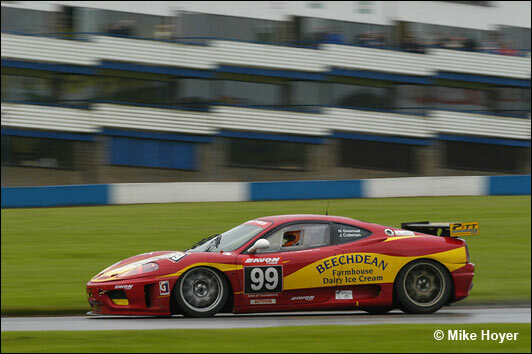 Beechdean focused on the wet tyres only, so despite being as high as fifth place during the early part of the session, the Ferrari dropped down the order and ended the session 19th overall, ninth in class, with a best of 1:25.317. The organisers decided that two fifteen minute qualifying sessions, separated by a five minute ‘break’, was still the right thing to do, despite there being a single two hour race on Sunday. The teams were free to decide who went out in each session, and driver changes during the sessions were also permitted. 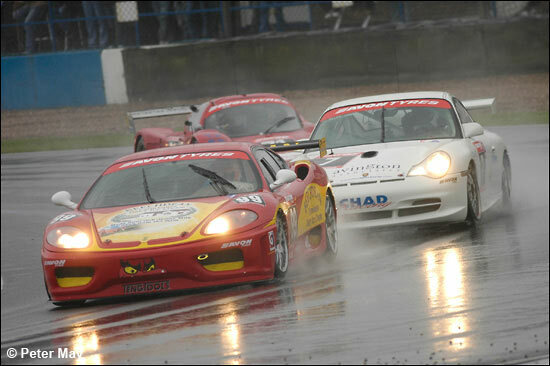 Nigel Greensall was slated to start the first qualifying session, but conditions were not as the team had been hoping for. A constant breeze, plus support series action, had lifted the film of water off the tarmac and it was to be a full dry session, though times were down on last year’s dry sessions. “We missed the start of the session as we were still fitting the new Performance Friction brake discs and pads that we were running for the very first time. The first session was just bedding the new brakes in, after making sure they worked of course!” A best of 1:14.727 towards the end of the 15 minute session gave Cunningham a benchmark. Nigel only had a couple of minutes to give it his best shot, because two laps later the chequered flag came out, with just enough time for a best last lap of 1:14.265. 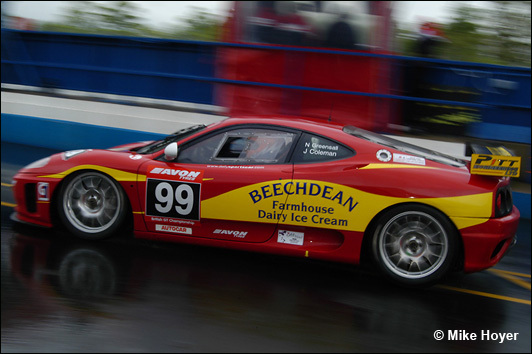 With the best time from either session counting, the Beechdean Ferrari would start the two hour race from 20th spot, still ninth in class. 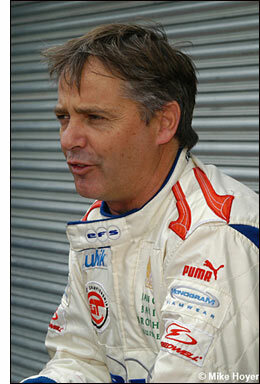 Nigel Greensall had done the work to put the car on the grid, but it was Neil Cunningham who had the job of starting the race. The team’s prayers had been answered, with steady rain in the hour or so before the start, so it was full wet conditions under dark, brewing, grey skies and spotting with rain. It was almost as if he had been imbued with the 20/20 vision of hindsight, because it was a tactic that worked very well for him, whilst others spun and barged into one another throughout a relatively chaotic race. Not content with battling with the other GTC cars, the Ferrari was also mixing it with the GT3 frontrunners – first a good scrap with the #33 Aston Martin, swapping positions, then getting in front and staying there, before stretching out to go on and overtake the GT3 leader, in pursuit of GTC riches. The on-track madness continued. Numerous GTC cars had already spun, slithered and banged into each other, but a bigger incident was the most significant for Beechdean. A clash between another GT3 Aston Martin and the Dove Ferrari at Coppice also ensnared Miles Hulford and Bradley Ellis, but the Beechdean Ferrari was fortunately away from the danger zone at the time: the cautious but quick strategy moved them up to fourth in class. 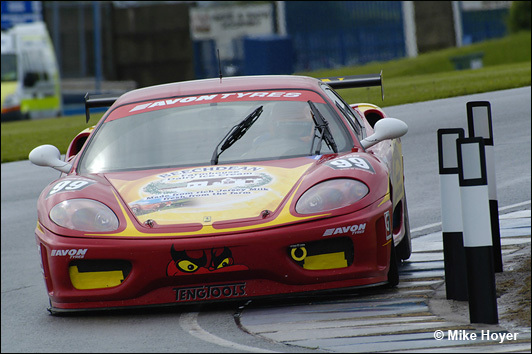 Cunningham and Pullan had been holding position for a large chunk of the first hour, but Pullan stretched away to set about the double-winner at Oulton Park – Team Tiger’s Marcos Mantis. “I couldn’t pass that Prosport, it was really, really quick.” For lap after lap Beighton made the Marcos even wider than its cartoon-flared wheelarches should have been, and his defensive driving allowed Neil to stay in the frame. 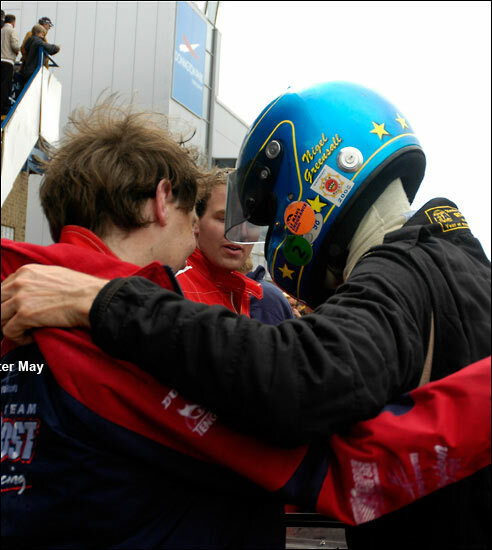 Once Pullan was past the Marcos, he set about the race leader and took over at the front – the conditions suiting the little Prosport better than any other GTC car at that point. The track continued to dry and cars were visibly moving way off line on the straights to try and find water to cool their tyres. It was no surprise to see intermediate tyres being readied in the pit-lane, as the driver changes began. It wasn’t phasing him at all though, because despite his WRC-style slides down the hill, he was still able to overtake on the outside at the Old Hairpin – it truly was a fantastic drive. With just 45 minutes to go, Chris Beighton finally pitted from the lead and handed the Mantis over to Jon Finnemore. This left Neil Cunningham in the lead, a sight that the whole team has worked immensely hard for: it will continue to put in the hours to ensure it becomes a common one. Cunningham stayed out as long as he possibly could without running out of fuel, in order to make sure that the intended slicks would be a boost to Greensall - and not a banana skin. The team had spent part of Sunday morning draining the fuel tank to accurately calculate the fuel used during qualifying – which was also the subject of a sweepstake for the team members. The news was very encouraging and Nigel Greensall was closest, until he was disqualified from the bet as he had been in control of the loud pedal. Had he really been sand-bagging to save fuel and win his bet? Of course not. With Greensall installed, the Ferrari shot out again, emerging from the pitlane just behind the Marcos, which had also retained its wet tyres, and had inherited the lead once again. The #5 Porsche, which had been a contender throughout, had dropped away after its earlier pitstop, after a decision to switch to intermediate tyres. 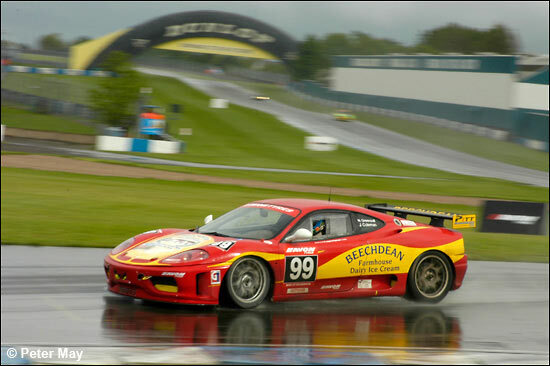 Allison was gaining on both Marcos and Beechdean Ferrari for as long as that tyre choice remained the right one, but the rain stepped up another gear and then went into overdrive. You could almost see Finnemore and Greensall grinning as intermediates became a liability, more spins ensued and even those that hadn’t spun had to tiptoe round and make an extra stop to put the wets back on. 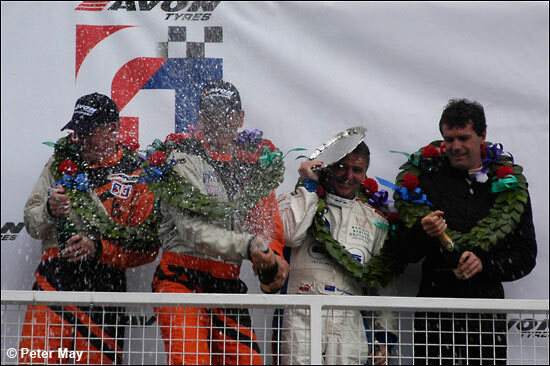 That situation affected the leading GT2 cars as well, so such was the advantage of Beechdean’s strategy, they inherited a phenomenal third place overall, which they held to the finish, behind yet another class win for the Mantis. At no point in those closing stages was the Beechdean car separated from the Marcos by any less than two cars, but time began to run out. “You never give up though, even when I went onto the final lap surrounded by about five other cars, and losing a little time to the leader, you still go for the win, it’s the only way. The only time you settle for second is once you’ve crossed the finish line,” explained Nigel after the race. Neil Cunningham had had a good day, too. “The wets didn’t chunk at all. This was my first time racing a Ferrari and the first time in years that I’ve driven a race car with an H-pattern gearshift. I’m really pleased to have had so much fun out there and done a good job for the team, which has worked so hard for this kind of result. My only grumble would be that we finished third overall, so where’s my trophy?!"